Try walking a day in this woman's shoes - on Saturday, artist Sonja Hinrichsen and 9 others teamed up at Colorado's Rabbit Ears Pass to create these incredible drawings made entirely from footsteps. In a project Hinrichsen aptly calls "Snow Drawings", the installation spans several hundred feet, boldly engraving itself into the expansive snow-covered meadow. 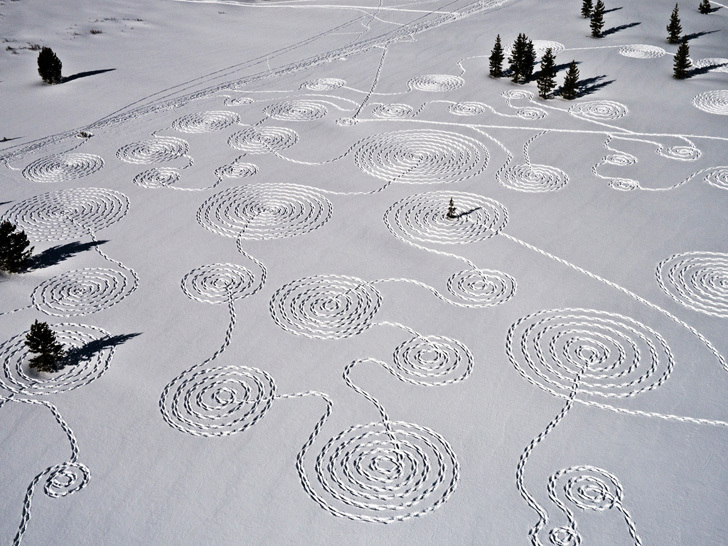 The undertaking was organized as a community art project that offered three days of collaborative snow drawing as part of the Steamboat Springs Arts Council exhibit "Snow Crystal". Hinrichsen’s “Snow Drawings” project is a community endeavor that has run for 3 days over the past two weeks, and has relied on the enthusiasm of local inhabitants to create. A contemporary artist visiting from San Francisco, Hinrichsen has been doing similar projects on her own across the country from New York to Aspen, but in Steamboat, she felt that the outdoor- and snow-oriented community would be a perfect fit for her new idea. However, the finished piece was captured captured on something more everlasting. Photographs and video documented the hours of snow stomping that occurred on Saturday, and at the end of the session the artist went up in an airplane to capture aerial images of the project. Hinrichsen's "Snow Drawings" project is a community endeavor that has run for 3 days over the past two weeks, and has relied on the enthusiasm of local inhabitants to create. A contemporary artist visiting from San Francisco, Hinrichsen has been doing similar projects on her own across the country from New York to Aspen, but in Steamboat, she felt that the outdoor- and snow-oriented community would be a perfect fit for her new idea. In just a few days, the artwork has already begun to fade, and with more snow and gusty winds forecasted, the designs will soon be indiscernible. However, the artist isn't sad, it's the impermanent nature of the project that intrigues her.